There's some tragic news out of Drexel Hill, Pennsylvania this weekend: a 19-year old woman is dead following an automobile accident. And apparently the motorist was distracted by the iPod she was trying to work while driving the car. Normally, I don't think it's much of a problem to talk on a cellphone or work an iPod while driving. It's not much different an effort than messing around with the radio trying to find a good station (and it's pretty darned rare to hear of any crash being caused by touching that dial). Just for safety's sake though, I don't usually do things like that unless I'm securely on the road (i.e. not about to make any turns) and not otherwise distracted by anything else. 'Cuz hey: at that moment the velocity of the car is gonna be my top priority. But I also don't believe that a driver should be text messaging while going down the road. That's a lot of focus and attention getting demanded from a device as opposed to passive use just by talking into it, or using simple movements with your thumb. And that's one of the reasons why I ain't been keen on getting an iPod Touch, either. I've tried the iPod Touch before, either at an Apple Store or one of those that some of my friends own. Personally, I found the model to be much harder to passively use than the original design of the iPod Classic. Even a simple task like changing the volume requires considerable visual contact with the device. And to use the iPod Touch (and the iPhone for that matter) most efficiently, one more often than not has to use both hands. None of these things have ever been an issue with the iPod Classic and its simple, yet extremely functional click wheel. A driver can very easily adjust volume and skip tracks in an album with only the gesture of a thumb... and without having to take the eyes off the road. If need be, a bare minimum of visual confirmation (again, not more than to glance at the car's stereo system) is all that's needed to change album or artist or podcast. Is the same ease of use of the iPod Classic to be found on the iPod Touch? If it's there, I haven't experienced it. There's definitely not enough to want to trust myself with working an iPod Touch while on the road. I can and do however have plenty of confidence that I can work my iPod Classic while in my car... just as I do every day. But that's not something I could see doing with the iPod Touch at all. Some are reporting that Apple might be preparing to drop the iPod Classic model entirely, and compel its users to adopt the iPod Touch instead. I can't think of a worse thing that Apple could do with its popular multimedia device (yeah, even worse than not giving us the option to easily replace the battery) than to abandon the iPod Classic. And I say that as one who is absolutely eager to eventually get an iPod Touch: I'm just waiting for the flash storage capacity to catch up with what I'm used to from the hard drive of the iPod Classic (though I still wouldn't wanna drive with it). There is not only room for both models but a substantial need for consumers to be able to choose between the two. And for those of us who have operating a motor vehicle as an integral part of our daily lives, the iPod Classic is obviously the more safety-conscious alternative. Ideally, I would love for Apple to not only retain the iPod Classic, but to continue advancing it along with the latest technology (an iPod Classic with more than 80 gigs of flash storage would be nice, hint-hint). I just hope that Apple isn't considering letting the iPod Classic go just because the company wants to push sales from its App Store for the iPod Touch and iPhone. 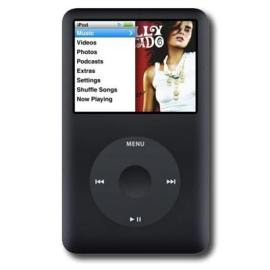 Doing so would certainly neglect a substantial portion of its users who appreciate the iPod Classic for its proven reliability, its iconic look, and its quality of being safe to operate in most any circumstance. iPod Touch & iPhone 3GS have a volume button on the left side of the device now, so changing the volume doesn't require visual contact any more. Also, the iPhone has a microphone and a playback control button in the earphones and you can skip tracks with it by clicking on the playback control, which is located right below your chin, and doesn't require contact with the device, at all. Only for switching albums you have to get visual contact with the iPod or iPhone. But that's just three simple taps on the screen and maybe some scrolling. I agree with you that the first model iPod touch (the one I had before my iPhone) wasn't really safe to use while driving my bike (yes, I gotto wait for my car until I'm 18 :-P) but with the iPhone, I don't have any problems any more and I feel even MORE comfortable cycling around with that device than with my "iPod video" (hell, that thing must be antique now, or what? :-P) as I can do so much more without having to hold the device in my hand. I'm keeping my 5th Gen iPod until they can get a touch with 160 gig HD I want all my stuff on my iPod not just some of it.